PT. 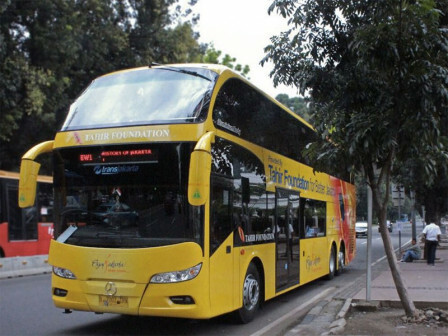 Transportasi Jakarta (Transjakarta) Public Relation Head, Wibowo informed that his side has operated Jakarta Shopping (BW7) route for Transjakarta.
" This shopping route will facilitate people who want to go shopping in a safe and comfortable way"
This route will facilitate residents who want to shop without considering where they should park their cars and its security. "This shopping route will facilitate people who want to go shopping in a safe and comfortable way," he mentioned, Saturday (7/21). Jakarta Shopping BW7 route is from Grand Indonesia-Tosari-Sudirman- North Gate of GBK (Archery Field)-Western Gate of GBK-Plaza Senayan-Senayan City. He explained, only two units serve for BW7 route. But those units are considered enough to facilitate people in getting alternative public transportation, especially when City implements odd-even traffic policy during Asian Games. This bus route operates on Monday-Friday from 10 AM to 6 PM. "While on Saturday, it operates from 10 AM to 10 PM and Sunday from 12-7 PM," he added. People who want to ride the bus can wait at Transjakarta bus shelter. While this route will continue to operate in the future. "It is free for passengers who take a ride on this route because shopping route is added to tour buses route which passengers can ride it for free," he expressed.